In 1985, total shipments of copper-base and foundry products related information appears on page 4. 3Represents uninsulated, bare tinned, and/or alloy coated wire. 3Beginning with the first quarter 1984, copper-base powder mill products were not collected. Source: Bureau of the Census Current Industrial Report, M33E(86)-1, Nonferrous Castings, issued April 1986.
of the Current Industrial Report, M33E(84-13), '. I.- rr._ . :, Summary for 1984, issued February 1986. 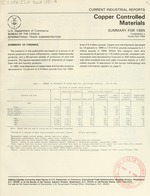 6For 1983, this report was collected on an .w.,- rIu,--r r.., quarterly basis. 7Source: Bureau of the Census Current Industrial Report, M33E(84)-13, Nonferrous Castings, Summary for 1984, issued February 1986. D.C. 20230, or to the Bureau of the Census, Industry Division, Washington, D.C. 20233, or call Pamela Glekas. 4Reported in copper content weight rather than metal weight. 6Wire, uninsulated, bare, tinned, and/or alloy coated. produced and consumed at the same location In the production of finished products. 7Source: Bureau of the Census, Current Industrial Report, M33E(86)-1, Nonferrous Castings, issued April 1986. See footnotes at end of table 3B. 2Source: Bureau of the Census report EM 546, U.S. Exports. 3Source: Bureau of the Census report IM 145-X, U.S. Imports for Consumption and General Imports. 4Apparent consumption is derived by subtracting exports from the total of net shipments plus imports. 5This total excludes insulated wire products and brass and bronze foundry produ, ts. rather only represent a percentage total for each quarter of 1985. IThe import and export numbers for this line do not include wire. companies are included in the mail panel. tions fr r this series. tion rates above 10 percent should be used with caution. in DPAS regulation, whether new, remelted, rerolled, or redrawn. treatment in accordance with provisions of the DPAS regulation. DPAS. Defense Priorities and Allocations System. the three sets of data. and other charges to the export point. * Imports- Valued at the first port of entry in the United States. charges to the import point. such commodities may contain a certain amount of duplication. at the more detailed levels might, therefore, be slightly overstated. intermediaries (wholesalers, exporters, etc.) are involved. that used or rebuilt products are significant in trade. cludes the 50 States, the District of Columbia, and Puerto Rico). before 1959) available at your local Federal Depository Library. A quarterly Current Industrial Report is published in this series.